The Westboro Baptist Church is an organization in the United States that is well-known for its use of inflammatory hate speech towards a number of groups, religions, and types of people. Their protests at military funerals is an example of just that. Several years ago, a couple of veterans couldn’t take it anymore when they saw one of the protesters stomping on the flag during a protest against a military funeral for Army Sgt. Donna Johnson in North Carolina. They decided to take action and take the American flag back from the protester. Sadly, this behavior occurs too often from the Westboro Baptist Church. This organization is known to picket at the funerals of celebrities, politicians, and our veterans. They are constantly looking for attention by reaching new deplorable lows. In the video, there are about five Westboro Baptist Church protesters holding up hateful signs. They are met with around a dozen counter-protesters who are there to support the funeral. Several police officers are at the scene making sure that violence doesn’t break out between the two sides. While the church protestors have their right to free speech and can legally protest the funeral if properly organized, the counter-protesters also have that same right to make their voices heard. These veterans chose to not sit on sidelines and go after the guy instead, despite having to fight off some of the police officers to get it back. One of the veterans charged into the group of protesters and hit the one who was stomping on the flag. After wrestling the American flag away from the protester, several police officers intervene and take down the veteran who took the flag. They place him in handcuffs and take him away. The veteran was not charged and was later released following the incident. Two other veterans run towards the veteran lying on the ground after noticing that the American flag is lying on the ground as well. 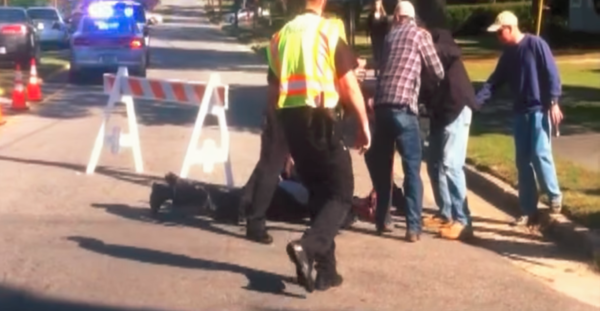 The veteran asks the officers if he can grab the flag, but the officers push him back, telling him to stay away. 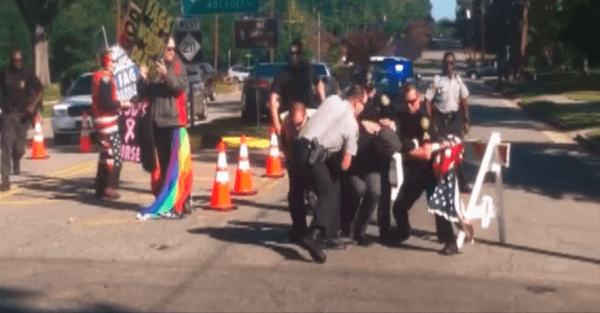 After getting the flag handed to him, one officer immediately gets up and snatches the flag from the veteran. He then begins yelling at him, presumably telling him to drop the flag and back away. After a brief fight for the flag, the officer is calmed down by a man in a black jacket and proceeds to let go of the flag. The crowd of counter-protesters start cheering and chanting “U-S-A” as the two veterans carry the flag away.